What’s this “presentitis” I keep hearing so much about? If you spend much time using social media to keep up with what’s going on the PowerPoint and presentation industries, or if you attended last year’s Presentation Summit in New Orleans, you have most likely come across references to something called presentitis. 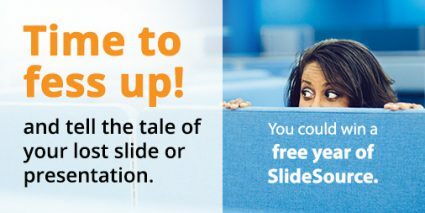 “Presentitis” is a term used by SlideSource.com and its parent company, Research Presentation Strategies, to describe a slide-related stress disorder common among presenters as well as anyone involved in creating and managing their presentations. 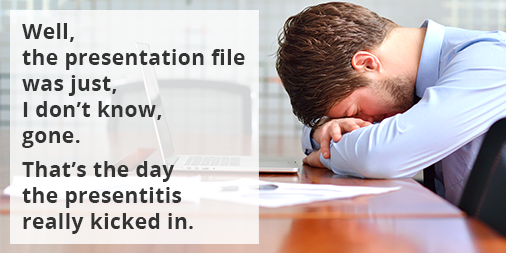 Presentitis is usually caused by a lack of good file organization and/or version control issues. These problems can be difficult to avoid due to the meagerness of the default tools we have at our disposal to share and store presentation files. Geetesh: Bob, what exactly is Presentitis? Also, are those who suffer from Presentitis aware that they have a problem? Bob: Presentitis (pre-sen-TIE-tis) is a serious, slide-related stress disorder that is common among all types of PowerPoint users. It causes a wide range of chronic health problems for both presenters and the people who create and manage their presentations. Recent studies have shown that presentitis is on the rise around the world and often goes undiagnosed. It may affect as many as 26,000,000 people in the United States alone. But sufferers may not even realize they have this serious, debilitating condition. Diagnosing presentitis can be tricky. Symptoms can be vague or extremely similar to other ailments like gallbladder problems, bladder or urinary tract infections or gastritis. SlideSource.com has also created an important resource to help those who may be suffering from this dread disorder. This website, presentitis.com explores in more detail the causes, symptoms and prevalence of presentitis. You will also find a presentitis risk self-assessment that will help you determine the chances of becoming infected and what steps to take to prevent or cure it. SlideSource.com is committed to working hard to eradicate presentitis and hopes that this terrible but completely curable disorder will soon be a thing of the past.